It's been six years since Gore Verbinski's remake of The Ring washed up on these shores and raked in $130 million at the box office, and just about every last J-horror retread that Hollywood's churned out since has been borderline-unwatchable. I'll admit to not expecting much from The Eye, but much to my surprise, this update of the Pang Brothers' 2002 film is...well, good isn't the word, exactly, but it's hardly the disaster that dreck like Pulse and One Missed Call have been, and I'll take my almost-victories wherever I can get 'em. 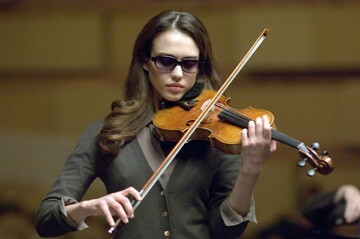 Jessica Alba stars as Sydney Wells, a concert violinist who's been blind since childhood. A cornea transplant gradually restores her sight, allowing Sydney to to see the world around her for the first time since she was five, but there's one mildly unpleasant side effect: she's plagued by visions of the undead. Her doctor (Alessandro Nivola) is convinced that it's just the difficult adjustment in being bombarded with the familiar sights the rest of us take for granted...her difficulty in interpreting what's essentially an entirely new sense. Sydney, meanwhile, is hellbent on discovering whose eyes these once were, certain that there's some connection between these grisly visions and the donor. So many of the J-horror remakes I've suffered through over the past few years have felt like limp, lazy cash-ins: a writer or director using 'em as a foot in the door, bankrolled by studio beancounters just because the budgets are low and the margins are respectable. If nothing else, The Eye feels like it's propelled far more by sincere effort than the rest of the lot. It's visually stylish. The screenplay may shrug off the rest of the cast -- improbable big sis Parker Posey and not-quite-love-interest Alessandro Nivola are completely squandered as bland, faceless cardboard cutouts here -- but Sydney Wells is surprisingly richly drawn. Transitioning from a confident, assured, wholly independent blind woman to someone seemingly normal but unable to cope with a newfound sense adds a psychological layer to Sydney that's much more compelling than the generic Pretty Girl Knee-Deep in Supernatural Hijinks™. That's why it's such a drag that The Eye's scares are all room temperature J-Horror clichés: jittery, barely discernable angels of death, chalk-white ghosts leaping towards the camera, maimed corpses slowly lurching around but never actually doing anything... Directors David Moreau and Xavier Palud have little trouble establishing an eerie mood, but the tense, unsettling atmosphere they aim for continually escapes their grasp, and the jolts and jump scares almost always miss the mark. A Korean kid squatting in a bubble wrap raincoat chanting "have you seen my report card?" or a pair of feet dangling a couple inches above the base of an elevator don't exactly leave me reaching for my nightlight. There's an endless parade of ghosts, but since they never do anything but go "boo!" (and a few of them are too meek and polite to even do that), they quickly start to seem more like a pest than a menace. The Eye really starts to lose me as it trots down to Mexico for the finale, building up to a climax that seems like it's been nicked from a completely different movie. At least The Eye is well-made enough that the pacing really doesn't drag all that much, not relying too heavily on the pyrotechnics and lightweight stabs at horror to keep things chugging along. Jessica Alba manages to be both the best and worst thing about The Eye. While Alba's never been an actress cast for her dramatic chops, there's an earnestness to her performance that drives the movie. She sells some of the psychological depths of her character's struggle far more effectively than I would've thought, particularly how Sydney was comfortable being blind. Having been unable to see since she was a very young child, restoring her sight means that she doesn't know where to visually focus her attention. She can't read, instead continuing to turn to Braille and OCR software. She can't interpret facial expressions. It's overwhelming, reducing a confident and independent blind woman to someone destined, for a time, at least, to be a barely functional adult. Alba clearly invested a great deal of effort researching and rehearsing the part, and there are enough nuances and subtleties that make Sydney feel like a blind character rather than just an actress in whited-out contacts or dark glasses. Alba still struggles with the line delivery, though, and her acting is stilted and awkward enough to be distracting. Everything I've written to try to summarize my thoughts on The Eye winds up reading like a backhanded compliment, stringing together words like "competent", "adequate", and "okay". It's not terrible. It's not great. The Eye dangles somewhere comfortably in the middle. While it's not a movie I'd actually recommend, and I'm not exactly left with the impression that it'll hold up the second or third time through, I got enough out of The Eye to find it worth a rental or catching on cable down the road. Not good, exactly, but good enough. Rent It. Video: The Eye is an intensely stylized movie, frequently blanketed in deep, impenetrable shadows, awash in pale blues and greens, and interspersing a slew of out-of-focus shots from Sydney's blurry perspective. While this doesn't make for a reference quality Blu-ray disc -- the level of fine detail takes a bit of a hit during its most stylized scenes -- The Eye consistently impresses throughout its brighter and more colorful moments. The 2.39:1 image is crisp and clear throughout, with the obvious exception of those POV shots as Sydney recovers from her surgery, and the slightly muddy contrast of some of the early scenes tightens up as The Eye goes along. As challenging as some stretches of the movie can be, particularly the quick-cutting as Sydney is assaulted by an unrelenting barrage of images, the AVC compression never once buckles. It's a pretty terrific looking disc, in keeping with the quality of work Lionsgate has been hammering out as of late. Audio: The Eye sports a DTS-HD Master Audio 7.1 soundtrack, although like the movie itself, the sound design is less bombastic than most of the horror crowd. Because the scares can be kind of sparse, the mix isn't as aggressive as usual, although there are plenty of ghostly sounds swirling around the surrounds along with eerie discrete effects in the dead of night to try to add some tension. The mix has more of an atmospheric bent than anything else, making frequent use of all of the channels on-hand even if it's not the sonic rush that the genre usually serves up. The dynamic range is expansive, bolstered by the colossal stings in the score along with the hellish amount of bass that The Eye belts out during its pyrotechnics. As expected for a day-and-date release with a lossless soundtrack, the clarity and distinctness of each element in the mix are consistently impressive. While The Eye isn't the sort of aural explosion I went in expecting, this is still a solid effort. This being a movie with a blind lead character and all, it kind of follows that a descriptive audio service track would be included. Other audio options include English and Spanish subtitles, a Dolby Digital 5.1 dub in Spanish, and a stereo French track. Sorry, I couldn't resist using a shot from a horror flick that involves screaming into a fire-spewing nightmare oven. in total, and that second disc is nothing but a standard definition copy of the movie for iTunes and Windows Media based devices. Even though The Eye is kinda light on extras, the bulk of them are in high definition and at least look phenomenal. "The Eye: An Explosive Finale" (6 min.) follows how the megaton explosion in the climax came together, from planning it out with a big stack of toy cars to the production design of the border crossing to the elaborate pyrotechnics. "Shadow World: Seeing the Dead" (8 min.) delves a little more in-depth into the concept of cellular memory, rattling off a string of real-life incidents before the featurette takes a more supernatural bent. "Becoming Sydney" (5 min.) follows how Jessica Alba settled into the role of a blind violinist, touching on how she learned to so convincingly fake being a virtuoso on the instrument as well as how she picked up the intricacies of playing a strong, independent woman accustomed to the loss of her sight. "Birth of the Shadowman" is the last of the featurettes and the shortest of the bunch, barely breaking a minute in length minus credits. It shows skeletal VFX artist Brett Haworth prepping for his turn as The Eye's barely-there angel of death, and the quick glimpses of raw footage of elaborate makeup that's never really seen in the movie make it one of the more memorable extras on the disc. Rounding out the high-def extras is The Eye's theatrical trailer. The eleven minute reel of deleted scenes is a mix of quick character moments and a little more genre flavor. Sydney sloshes her way through a hallway sopping with blood, she rips out strings of...something from her eyes in one semi-gruesome nightmare, and there are a couple more quick peeks at ghosts, down to the usual J-horror cliché of a twisted corpse dragging herself across the floor. The additional bursts of characterization are pretty light, but Lost's Marvin Candle does get a bit of screentime as the father of the ghostly "have you seen my report card?" tyke downstairs. This timecoded footage is in standard definition and hasn't been enhanced for widescreen displays. Conclusion: There's almost a decent thriller in here somewhere, but The Eye is dragged down by its lack of worthwhile scares and an earnest but stilted leading turn by Jessica Alba. The Eye is...well, watchable, pun intended, and even though this isn't a great horror flick by any stretch, I don't think it'd make for a bad rental. Rent It.